What is known as “The First Thanksgiving”, the three day harvest celebration of the English Colonists of Plymouth known as the Pilgrims and the local Wampanoag Indian Tribe was probably very different from a traditional Thanksgiving dinner today. There is no official record of what was served, but there is plenty of information on what was not available, and it was a lot. 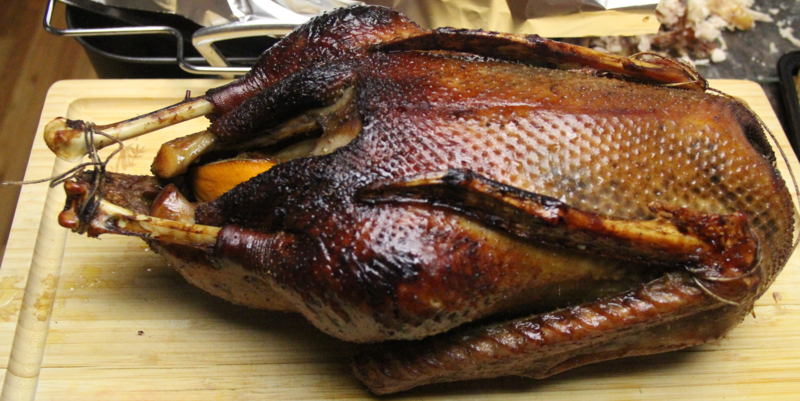 Turkey may have been served, but it was more likely duck or goose. Potatoes had not made it into the Indian diet yet and the English still thought they were poisonous. Sweet potatoes were still a rare delicacy in England, and thought to be a potent aphrodisiac, so not really in line with the whole Puritan ethos. Apple’s are not native to North America and were not imported until the end of the 17th Century. (“As American as Apple Pie”, pretty much means, “As American as any English Import”) Sugar and Flour would have come from the supplies the Pilgrim’s brought with them, which would have been almost completely depleted by this time. So no pie of any kind. No cows or goats or other dairy animals. So no milk, whipped cream, butter or cheese. I know what you are thinking… you will have an absolute mutiny on your hands if you eliminate all of these time-honored favorites in pursuit of absolute authenticity. Don’t Panic! The Historic Hostess is here to help you throw fun parties with delicious food and fascinating historical backstories, not to torture your family and friends by forcing them to politely endure the culinary constraints of a society who were celebrating that half of their original party were still alive, and that they had anything to eat at all. So we have created a menu that is inspired by this first feast, incorporating the ingredients they were known to have had, avoiding things we know they didn’t have, but cheating here and there when the taste compromise would be too great. We make an effort to note where we stray from reality, so you can make more severely accurate choices if you like. While this 1621 feast is the event commemorated in our modern Thanksgiving celebrations, it was not what would have been considered “a day of thanksgiving” in 17th Century culture. In those days, a day of thanksgiving was a day of religious devotion spent in prayer and fasting. It was pretty much the opposite of the secular celebration of overeating and football that it is today. The Pilgrim/Wampanoag party, however was a celebration of the harvest. This was a common practice both in English society and among the Native Americans. Edward Winslow’s account (the only primary account of the event) lets us know that this was no dour day of supplication, but a long weekend of eating and merry-making. The Puritans were not big on recreation in general, and did not really keep records of what they did for fun, as fun was frowned upon. But we do have knowledge of popular entertainments of the era, and some of which are still played today, other more unfamiliar games would be a lot of fun to recreate. The Pilgrims did not make an annual event of this first Thanksgiving Day in the New World. In fact, while various states celebrated a day of feasting in thanksgiving in the early days of the republic, the date was not fixed nationally until 1863 when Abraham Lincoln issued a presidential proclamation in an effort to unify the fractured country in the midst of the Civil War. And FDR finally made it a national holiday by federal legislation in 1941, and moved the date from the final Thursday in November, to the fourth (not always final) Thursday in November. The exploitation of this one shining positive example of Colonial and Native relations in the New World as though it was the start of a long and cooperative relationship is certainly a valid criticism of this holiday and how we look at it in this country. But I think it is important to look at an example of when we feel like we are at our best and hold that example up and try to emulate it. If the 1621 Harvest Festival Feast shared by Pilgrims and Wampanoag Indians is the best example we have of accepting help from more experienced people, and then graciously thanking them for it by sharing the bounty of that assistance, then that is what we are celebrating, teaching and trying to replicate. We have failed at it many times in the last 400 years, but that doesn’t mean we stop being thankful that it happened once, and try to make it happen again. The Historic Hostess is thankful for our readers, for helping us to celebrate the best our varied cultures have to offer and to learn from the mistakes we have made as a society throughout history one meal at a time. We are thankful for our families and friends who have helped us cook, photograph, research and most importantly, shared these meals with us. We are thankful to have the means to make this food, to learn about it, to write about it and to have an audience to read about it. And this year we are especially thankful for the healthy birth of Baby Mara Moran Coffey, the newest Historic Hostess. We are looking forward to many celebrations in her honor. This is not the least bit realistic. Fun, party cocktails is not at all an idea these people would have been familiar with. However, that is not to say they did not drink alcohol. A frequent shipboard ration of beer was a mind blowing gallon per person per day (man, woman or child). But they would have been low on supplies at this time, and though they grew barley, the fermenting process is so time consuming they probably did not yet have any ready by the time this celebration took place. Water was probably the beverage on offer. But just because they were abstaining out of necessity, doesn’t mean we have to. This is the perfect use for any left over pumpkin and whipped cream you have laying around. Mix pumpkin puree and heavy cream until you get a drinkable consistency. Then add whisky or bourbon to taste. 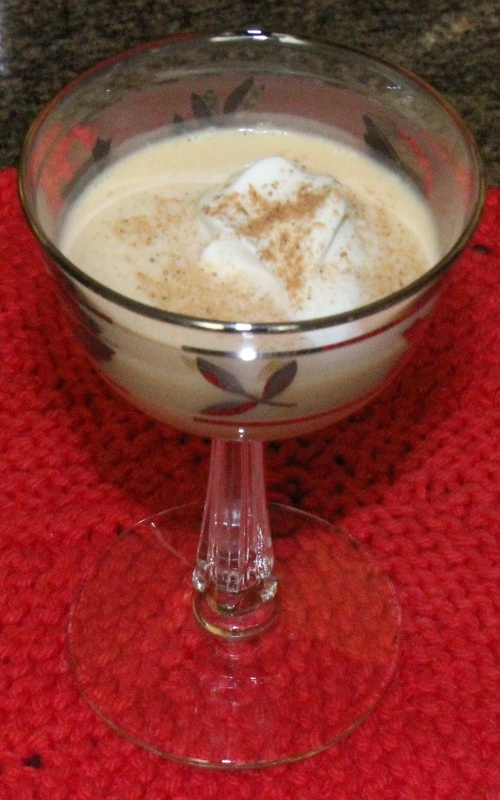 Add a dollop of real whipped cream on top of individual drinks and top with nutmeg. One of the few things that is actually known about the 1621 feast is that the Wampanoag brought five deer to share with the Pilgrims. Talk about good guests at a potluck. No Two Buck Chuck and store bought dinner rolls for these guys. Whether they knew it or not, this was a really smart diplomatic offering on the part of the Indians. In England, venison was only available to be hunted on the land of the gentry. It is was actually illegal to buy or sell it. Only the very rich had access to it, and it was a definite mark of class. Mushrooms also grew wild around Plymouth Colony, and the Wampanoag showed the Pilgrims which ones were edible and which ones would kill you. Considering that only 53 of the original 102 emigrants were still living by the first Thanksgiving, any advice that aided in staying alive was pretty valuable. Stuffed mushrooms as an appetizer weren’t really something you would have seen until the 20th Century, but they would have made wide use of both the main ingredients. Preheat the oven to 375 Degrees Fahrenheit. Mix the venison, oil and spices in a bowl. Set aside. Wash the mushrooms, and pat dry with a towel. 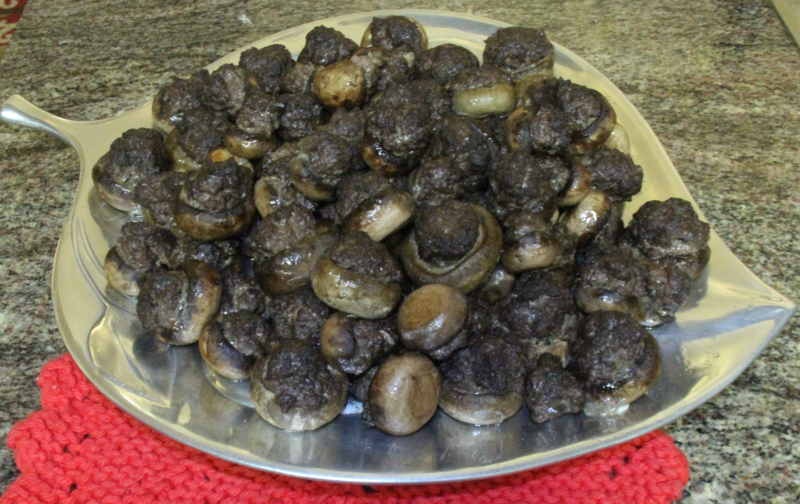 Remove the mushroom stems, place mushroom caps in a baking dish and spoon the meat mixture into the caps. Put enough meat in each cap so that the meat peeks over the top. Bake for 15 to 20 minutes, until the meat is cooked through. Serve immediately. Sobaheg is the Wampanoag word for Stew. 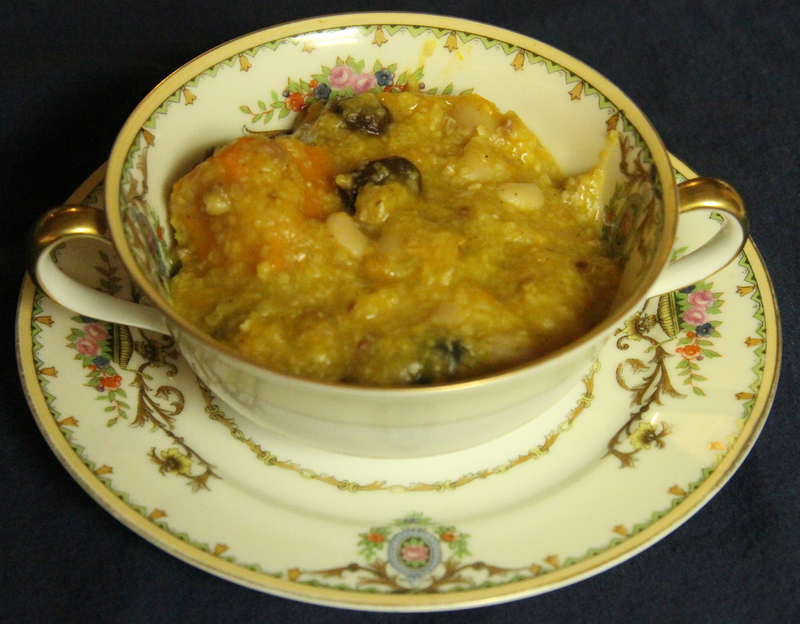 This is another dish that was very likely actually served at the first Thanksgiving. The recipe here is loosely adapted from Plymouth Farmer’s Market, Native American Cookbook and Giving Thanks: Thanksgiving Recipes and History, from Pilgrims to Pumpkin Pie. This is one of those fabulous recipes that can vary tremendously in ingredients and quantity depending on what you have on hand. We made a vegetarian version in deference to the non-meat eating guests at our Thanksgiving and served it as appetizer in small bowls (this is a filling dish so serve sparingly), but this recipe is also a great way to use leftover turkey if you are going fully authentic with a three day eating extravaganza. It’s also another place to through in some of the venison from the five deer your guests are going to bring. While it is fitting that the Wild Turkey, native to North America has become the symbol of Thanksgiving, it is most likely that the Pilgrims feasted on Goose or Duck on the day. In the only references to the meal in question, Edward Winslow mentions, “They four in one day killed as much fowl as, with a little help beside, served the company almost a week”. This reference to fowl could include turkey, but most historians tend think he means waterfowl. Goose had a long tradition in Europe of signifying the changing of the seasons, as they are a migratory bird. Sacrificing a goose in thanksgiving for a good harvest has roots in the Celtic Samhain, the Germanic Yule, or the celebration of the winter solstice. While the Pilgrims would certainly eschew such pagan rituals, the holiday goose had become such a part of English/Christian culture they would probably have participated in the rites without a second thought. 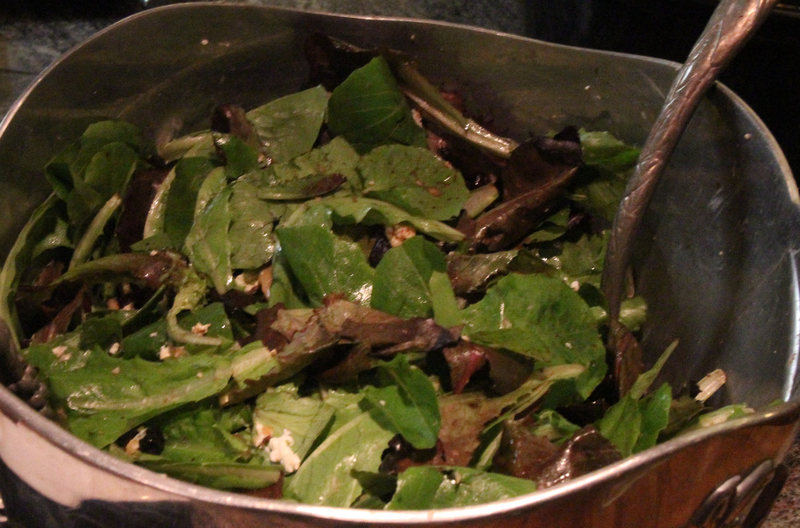 Lettuces were grown in the colonists kitchen gardens, cranberries, walnuts and blueberries were all locally available. Drying fruit was common practice for the English as a means of preserving. It is possible they had a few goats, therefore the cheese… but that is not certain if you are a real purist. Cabbage would have been grown in nearly every kitchen garden of the colonists and mustard was the most common condiment in the 17th Century. It was included on the colonial supply lists, so we know they had it. However, according to “Giving Thanks”, the Native Americans were not so fond of mustard. Explorer Bartholomew Gosnold reported on his experience of sharing food with some Native men in 1602 that they “misliked nothing but our mustard, wherat they made many a sowre face.” So we will assume this is a dish the Indians would not have enjoyed. Shred the cabbage and carrots if you didn’t buy them that way. Mix 3 tablespoons of Dijon Mustard with 1/4 cup White Vinegar, salt and pepper to taste. 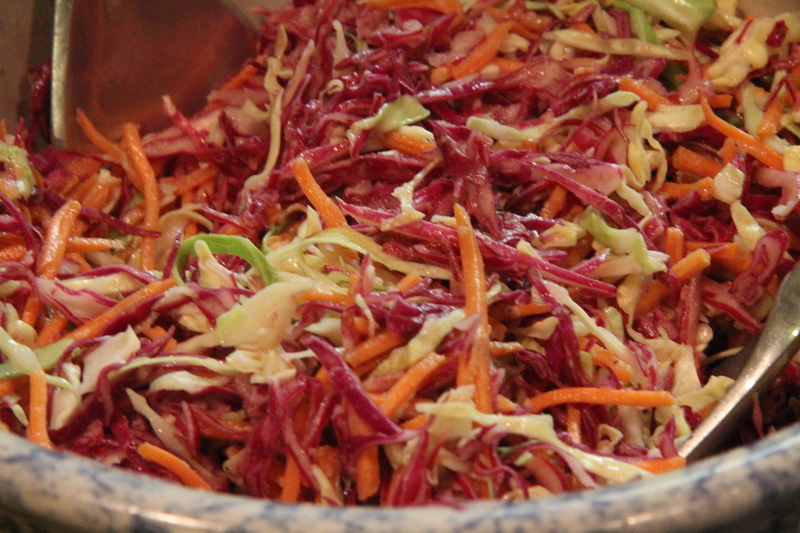 Toss with shredded cabbage and carrots.